A recent post on a diving forum stated “sidemounting is just a fad”. New(er) divers to the sport could be forgiven for thinking this style of scuba diving is a recent phenomenon. Sidemounting was actually invented in the 1960s by the Brits. They were exploring sites such as Wookey Hole, Swildons Cave and other underground systems, and would often find ‘the way on’ was blocked by a submerged passageway called a sump (*in the UK – VB). In order to explore further, these sumps needed to be navigated. British sumps tend to be short, cramped, flooded passageways, therefore buoyancy is not an issue nor is the use of fins. Cavers just needed a means to be able to breath and (sometimes) see where they were pushing. The caver would attach a cylinder and regulator to their body using a robust belt that allowed the cylinder to be worn against the body. This ‘English system’ of cylinder rigging allowed the explorer to crawl through both dry and wet sections of cave and keep on pushing the system. 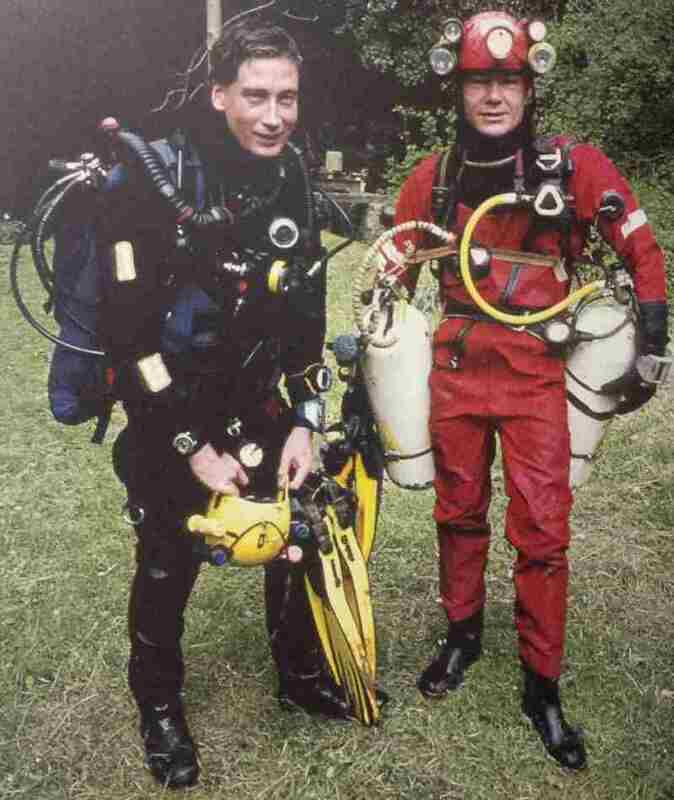 During the 1970s the ‘English system’ was adopted across the pond by Floridian cave divers. These cave systems tended to be properly flooded with the emphasis on diving to explore the cave. Buoyancy, trim and propulsion became an issue, hence cylinders were moved from the waist / thigh area, up towards the armpit and against the torso. Once again, these divers made their own rigging system. 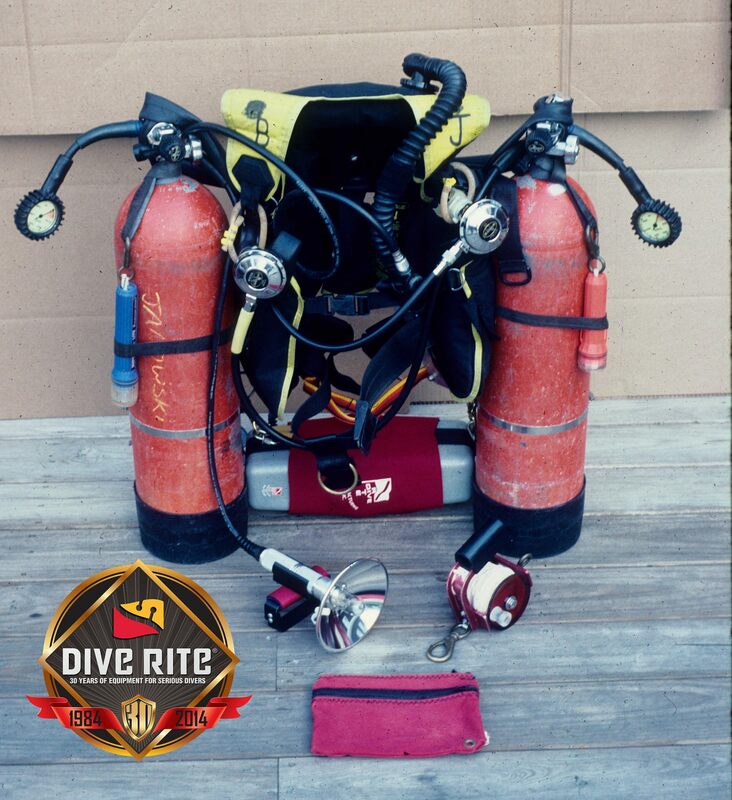 However it wasn’t until the mid 1990s that the first commercial sidemount diving system was manufactured by Dive Rite. This was designed by Lamar Hires, a renowned cave explorer and instructor. 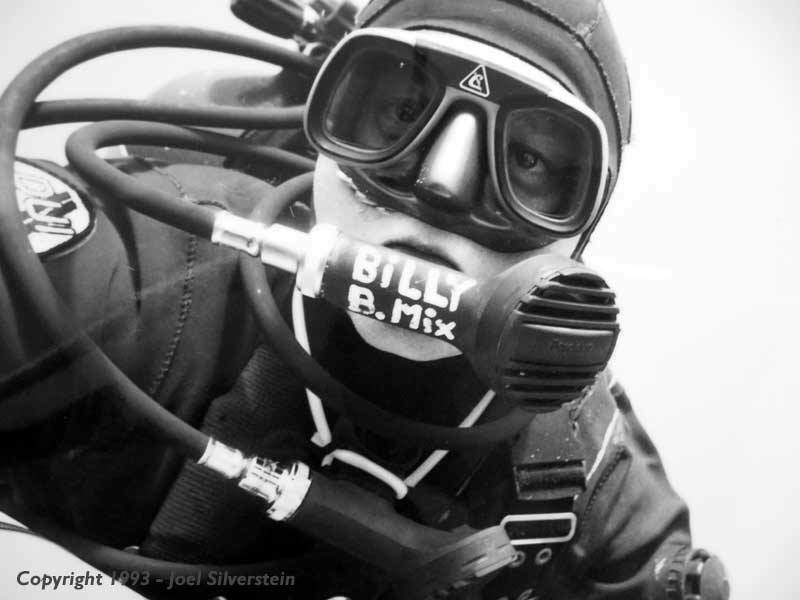 The following article by Michael Menduno is reprinted from the pioneering American journal for technical diving, aquaCORPS, V4, MIX, January-February 1992. Originally developed for the tight low visibility sump diving that is common in Europe, sidemounts allowed spelunkers to more easily transport single cylinders through a dry cave to the dive site. In North Florida, the use of sidemount techniques has allowed exploration into small silty areas that were once thought impassable and has opened up entire new cave systems that were simply inaccessible with back mounted doubles. Sidemounts reduce the strain of carrying heavy doubles up steep inclines, lowering cylinders down into a hole, and making those long walks through the woods to the dive site. Cave systems known to be silty can now be penetrated without heavy silting. Sidemount configuration means wearing the cylinders on the hips instead of the back. The cylinders are fastened in the middle with a snap to a harness at the waist. The necks are clipped off at the armpit using bungee material (a bicycle inner tube is preferred) so that the cylinders are forced to lay parallel to the diver’s body. Adjustments are usually needed at first to insure a snug comfortable fit. When diving with sidemounts, gas supplies must be balanced for adequate reserves throughout the dive. The regulator and SPG hoses no longer lay across the back and instead are clipped across the chest area. The management of these is critical for proper monitoring of gas supplies and switching regulators during the dive. Back-up and emergency equipment must be streamlined and tucked away to achieve the desired profile—no thicker than two cylinders that lay along the diver’s hips. Clearly, sidemount (*cave – VB) diving is not for everyone because of the potential hazards that exist; low visibility, line traps and squeezes that seem to get smaller and smaller are only a few of the obstacles to be overcome. A diver must be totally comfortable in all these conditions before considering sidemount (*cave diving – VB) as an alternative. Suitably equipped, divers who are, can usually find a way to squeeze by. Previously isolated from the underground and fellow wreckers to the south, the east coast wreck diving community evolved its own style of set rigging suitable for the cold dark waters of the north and the available technology. Still seen on the boats that work the Doria, Texas Tower, the Virginia and the San Diego, a typical east coast wreck diving set consists of a pair of double 80s or 95s (10.5 or 11.5 liter) or secured to a large capacity BCD jacket with a manifold system, or commonly two independent regulators, which are rotated throughout the dive. A 40cf (5.5 liter) pony mounted between the doubles serves as a bailout, along with a handmade upreel (hemp rope wrapped around a forearm-length aluminum spindle). For the most part, stage bottles, typically air, are something divers leave tied off to the anchor line at 10ft (3m), and oxygen for decompression is still used sparingly, if at all. Now with the advent of larger tanks, harness and manifold systems, improved decompression methods and mix technology, all that is changing. Today, a well-outfitted high tech wreck diver carries a pair of cold-filled Genesis 120s (14.5 liter) with DIN crossover manifold and valve protectors, shoulder mounted stage bottles, or ‘wing tanks’, containing decompression gas (EAN and or oxygen)—do you really want to bet your tissues on that cylinder clipped off to the anchor line? Harness, bag and back plate system, argon inflation system and of course an upreel. The result? Wreck divers are staying down longer, getting more of that first class china, and most importantly are doing it safer. After all, when you come right down to it, the most valuable artifact that you’ll ever bring home is yourself. Sidemount – what, why and how? Reblogged this on Amphibious Nomad.